The service for the life and legacy of Neville George Abraham Burke was held on Saturday 15 October at the New Life Baptist Church in Duff’s Bottom. Mr. Burke was born on 25 May 1940 and he departed this life on 24 September 2016. He was the fifth of nine children born to Theophelus and Emma Burke in Green Bay Antigua. He has been described as an individual who was industrious from an early age, and it was said that when he left school he went on to learn the trade of mechanic. In the late 1950s he came to the BVI where he started working at J.R. O’Neal and G.A. Cobham Ltd as a mechanic. Mr. Burke then joined his friend and countryman the late Keith Parker for a short while when he started Virgin Islands Motors before branching off on his own. In 1973, he established the highly respected Burke’s Garage Ltd, the home of Land Rover, Nissan and Subaru. Over the years he developed his own company. He stayed abreast of the advances in the auto industry by attending courses in countries such as Japan, South Korea, and China. His love and his kindness reached into his home church the New Life Baptist Church where he served as a Deacon. He selflessly shared his time with helping the church from the early years of the development of Baptist churches in the BVI over 50 years ago. It was a familiar custom for Mr. Burke to drive his Land Rover to the Brewers Bay Baptist Mission to transport the members from Road Town Baptist Church, and at the same time being the preacher and leading the rest of the service. It was on one of those church occasions that he met his wife Ethlyn. BVI Premier, Dr. the Hon. 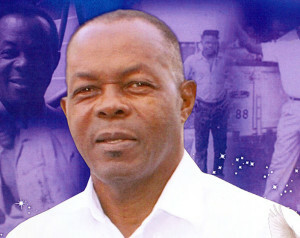 D. Orlando Smith, in a printed message, said that Mr. Burke made significant contributions to the economy of the Territory, and his love for automobiles was only surpassed by the devotion to his God. The eulogy noted that the dear departed’ humility, sharing and giving formed the foundation on which Neville’s character and life were based. His wife remembers him as her devotional partner, devoted husband and a true man of God. His son Theo remembers him as his mentor, business partner and friend. Together Mr. and Mrs. Burke shared 43 years of marriage, and had five children. The late Neville George Abraham Burke is survived by his: Wife — Ethlyn Burke, Daughters — Alicia Green, and Felicia Burke; Sons — Bradley, Theodore and Benaiah Burke; Adopted Son —Sheldon Nelson; Son-In-Law — William Green; Daughters-In-Law — Lelia Burke, Rosemarie Jackson-Burke; Grandchildren — Kaliba and Ryley Vanterpool, William Green IV, Gladston, Marlon, Leigha and Kaira Burke, and Nathan Lake; plus many other relatives and friends too numerous to mention. The publishers, management and staff of the Island Sun newspaper extends deeply-felt condolences to the family and friends of the late Neville Burke.